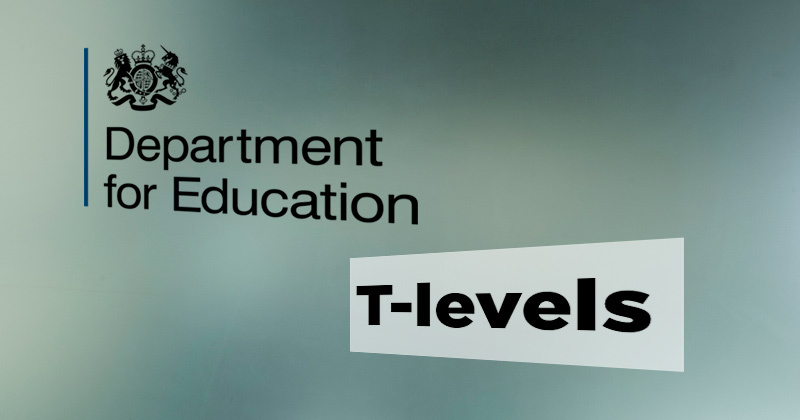 The Department for Education has today published its response to its consultation on T-levels. It sought opinions on the planned implementation of the new post-16 technical qualifications, which the government claims will set a new “gold standard” in training, the first of which will emerge from 2020. The 45-day minimum work placement component are an “essential part of T-levels”, according to the government. However, it is aware of concerns over the capacity of some employers and providers to offer industry placements, as well as the availability of placements in rural areas with poor public transport links, travel time and cost. The DfE has committed to putting in place a “comprehensive programme of support”. This includes “significant funding” through the Capacity and Delivery Fund, and offering an advice and support service for employers, including a “simple referral and matchmaking service” to providers through the National Apprenticeship Service. The DfE will also provide “additional bursary funding” in the 2018/19 academic year to help students travel to industry placements, and produce a “clear and simple ‘how to’” guide for employers and providers. Over 80 per cent of respondents want the government to provide additional funded hours for maths and English on top of a student’s T-level hours, rather than providing the study from programme hours. “We therefore intend to fund maths and English for students who have not yet achieved level two in addition to the hours required for the technical elements,” the DfE said in response. “In response to the desire to keep things simple, and make sure the significance of completing the T-level programme overall is properly recognised, we will introduce an overall pass grade,” the DfE said. This pass grade will only be awarded if a student successfully completes the industry placement, attains the technical qualification, and achieves the other specified elements of the T-level programme. On the T-level certificate, the technical qualification will be given a grade from a six-point scale (A*-E), and occupational specialisms will get a three-point grading scale (distinction, merit, pass). The DfE said it is exploring how higher overall grades could be awarded above an overall pass, such as merit and distinction. “In principle, we believe that a student should be able to take an A-level alongside their T-level, particularly if it supports progression outcomes for their chosen T-level,” the government said. Officials are “particularly supportive” of “high-attaining students” who want to take core maths or an A-level in maths alongside their T-level. There is “no legal requirement or expectation that T-level students will be paid,” the DfE said. But the department does “recognise that for some employers, any type of unpaid placement would discourage them from taking part in the programme”, so they are “able to pay students should they wish to”. The DfE is working with the Department for Work and Pensions to make sure that students, including those and their family who already receive benefits, are not “negatively affected by undertaking an industry placement”. When learners complete a T-level, they will be able to choose between moving into a skilled occupation, higher-level apprenticeships, or higher education. Consultation respondents suggested that allocating UCAS tariff points to T-levels would support progression into HE, an option which the DfE is now “exploring”. What happens to students not ready to start a T-levels at 16 has been a key issue. The DfE plans to offer a “transition” to help learners get to the standard required to start a T-level, but its consultation response did not explain how this will work. “We will do further work throughout 2018 to gather evidence on existing good practice of similar transition programmes, how the offer might meet employer needs, and what the role of the Institute for Apprenticeships might be,” is all the department said. Respondents to the consultation said the main challenge for providers delivering T-levels will be making sure that staff have “sufficient expertise, as providers will need to upskill current teaching staff and recruit additional skilled staff, especially in STEM subjects”. The DfE will be “working closely with the sector to design and develop a programme of support to help providers and teachers” to prepare for delivery, which includes an investment of “up to £20 million to help make sure teachers are ready to deliver new T-levels”. The government has confirmed the full roll-out of T-levels will not actually take place until 2023. The initial roll-out will still be in 2020, but in the T-level action plan the DfE proposed introducing another 13 courses in 2021 and the remaining nine in 2022.